Korea Adv. Inst. of Science & Technol. Department of Civil and Environmental Eng. This work was supported by the Korean Federation of Science and Technology Societies (KOFST) grant funded by the Korea goverment (MOSF&MSIP). 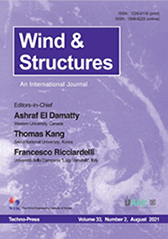 The WIND AND STRUCTURES, An International Journal, aims at: - Major publication channel for research in the general area of wind and structural engineering, - Wider distribution at more affordable subscription rates; - Faster reviewing and publication for manuscripts submitted. Pohang Univ. of Sci. & Tech. The Hong Kong Polytechnic Univ. High-resolution wind data were acquired from a 100-m high offshore tower during the passage of Typhoon Hagupit in September, 2008. The meteorological tower was equipped with an ultrasonic anemometer and a number of cup anemometers at heights between 10 and 100 m. Wind characteristics of the strong typhoon, such as mean wind speed and wind direction, turbulence intensity, turbulence integral length scale, gust factor and power spectra of wind velocity, vertical profiles of mean wind speed were investigated in detail based on the wind data recorded during the strong typhoon. The measured results revealed that the wind characteristics in different stages during the typhoon varied remarkably. Through comparison with non-typhoon wind measurements, the phenomena of enhanced levels of turbulence intensity, gust factors, turbulence integral length scale and spectral magnitudes in typhoon boundary layer were observed. The monitored data and analysis results are expected to be useful for the wind-resistant design of offshore structures and buildings on seashores in typhoon-prone regions. strong typhoon; wind characteristic; wind data measurement. Modeling swirling wakes is of considerable interest to wind farm designers. The present work is an attempt to develop a computational tool to understand free, far-wake development behind a single rotating wind turbine. Besides the standard momentum and continuity equations from the boundary layer theory in two dimensions, an additional equation for the conservation of angular momentum is introduced to study axisymmetric swirl effects on wake growth. Turbulence is simulated with two options: the standard k-e model and the Reynolds Stress transport model. A finite volume method is used to discretize the governing equations for mean flow and turbulence quantities. A marching algorithm of expanding grids is employed to enclose the growing far-wake and to solve the equations implicitly at every axial step. Axisymmetric far-wakes with/without swirl are studied at different Reynolds numbers and swirl numbers. Wake characteristics such as wake width, half radius, velocity profiles and pressure profiles are computed. Compared with the results obtained under similar flow conditions using the computational software, FLUENT, this far-wake model shows simplicity with acceptable accuracy, covering large wake regions in far-wake study. far wake; swirl; boundary layer; self-similarity; k-e model; Reynolds Stress transport model. Wind loads on low-rise buildings in general and residential homes in particular can differ significantly depending upon the laboratory in which they were measured. The differences are due in large part to inadequate simulations of the low-frequency content of atmospheric velocity fluctuations in the laboratory and to the small scale of the models used for the measurements. The imperfect spatial coherence of the low frequency velocity fluctuations results in reductions of the overall wind effects with respect to the case of perfectly coherent flows. For large buildings those reductions are significant. However, for buildings with sufficiently small dimensions (e.g., residential homes) the reductions are relatively small. A technique is proposed for simulating the effect of low-frequency flow fluctuations on such buildings more effectively from the point of view of testing accuracy and repeatability than is currently the case. Experimental results are presented that validate the proposed technique. The technique eliminates a major cause of discrepancies among measurements conducted in different laboratories. In addition, the technique allows the use of considerably larger model scales than are possible in conventional testing. This makes it possible to model architectural details, and improves Reynolds number similarity. The technique is applicable to wind tunnels and large scale open jet facilities, and can help to standardize flow simulations for testing residential homes as well as significantly improving testing accuracy and repeatability. The work reported in this paper is a first step in developing the proposed technique. Additional tests are planned to further refine the technique and test the range of its applicability. aerodynamics; atmospheric surface layer; building technology; low-rise structures; open jet facilities; residential buildings; wind engineering; wind tunnels. Many potential small wind turbine locations are near obstacles such as buildings and shelterbelts, which can have a significant, detrimental effect on the local wind climate. A neural networkbased model has been developed which predicts mean wind speed and turbulence intensity at points in an obstacle\'s region of influence, relative to unsheltered conditions. The neural network was trained using measurements collected in the wakes of 18 scale building models exposed to a simulated rural atmospheric boundary layer in a wind tunnel. The model obstacles covered a range of heights, widths, depths, and roof pitches typical of rural buildings. A field experiment was conducted using three unique full scale obstacles to validate model predictions and wind tunnel measurements. The accuracy of the neural network model varies with the quantity predicted and position in the obstacle wake. In general, predictions of mean velocity deficit in the far wake region are most accurate. The overall estimated mean uncertainties associated with model predictions of normalized mean wind speed and turbulence intensity are 4.9% and 12.8%, respectively. wind tunnel; small wind turbine; wind energy; micrositing; wake prediction; anemometer; sheltering; neural network. Over the last decade substantial improvements have been made in our ability to observe the tropical cyclone boundary layer. Low-level wind speed maxima have been frequently observed in Global Positioning System dropwindsonde (GPS sonde) profiles. Data from GPS sondes and coastal Doppler radars were employed to evaluate the characteristics of tropical cyclone vertical wind profiles in open ocean conditions and at landfall. Changes to the mean vertical wind profile were observed azimuthally and with decreasing radial distance toward the cyclone center. Wind profiles within the hurricane boundary layer exhibited a logarithmic increase with height up to the depth of the wind maximum. tropical cyclones; GPS dropwindsonde; radar; wind; profiles; low-level jets; velocity azimuth display.